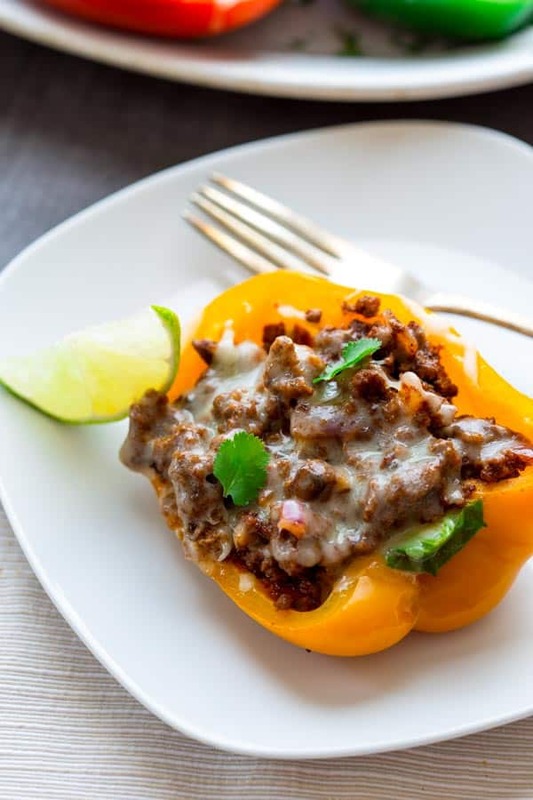 These cheesy spicy Mexican stuffed bell peppers come together in only 20 minutes for a low-carb, gluten-free and totally delicious weeknight meal. Welcome! If you’re new here you may want to sign up for my email list or follow me on instagram to keep up with the latest posts. Did I tell you that I am going to Mexico next month? The whole fam dam is jetting off for a week and I am trying to not get too excited too soon. I may or may not have been spending many minutes hours on Zappos mooning over breezy white cover ups and braided teal leather flip-flops. I may or may not have received these items on my doorstep yesterday afternoon and stripped down in the kitchen to try them on as soon as they came. And I totally didn’t buy a brand new new suitcase either. Help me. My name is Katie and I am addicted to Zappos. One day shipping! Free returns! How can you not love free returns? When the boxes arrived, the girls were almost as excited as me. They helped me unload the new suitcase which came in a comically huge box. The girls quickly forgot all about the stuff I was un-packing (and barely noticed that I was in the kitchen in a state of undress) and proceeded to turn the box into a giggle fest filled game of hilarity. I am not sure what the premise was. I think it involved them being store owners. Didn’t they know brick and mortar is dead and Zappos is where it’s at? Sorry. Not Sorry. I do know that poor Judy T got to star in the game. At one point both my 7 year old and the lab were in the box at the same time. Thankfully nobody got hurt. The box however has seen better days. Also in preparation for our trip and wearing not much more than a bikini, said breezy white cover-up and teal flip flops, I am amping up my workouts. Jase is too. (Back to back classes this morning for me and way more cardio for him) and we’ve been avoiding the evening snack fest. I’m not dieting or anything like that, since as a chronic dieter turned intuitive eater, I know that doesn’t work for me. But I am reigning it in to drop a couple holiday lbs before we go. Hopefully this strategy won’t backfire. Basically, I’ve been steering away from excessive amounts of carby stuff at dinner (sorry risotto you have to wait a little longer.) I’ve been bulking up on mega veggies and lean protein. I’ve been having a slice of whole-grain toast with my egg in the morning. Eating off a small plate. All that good stuff. Nothings off limits, I’m just giving everything the “do I really want to eat this?” test before I go for it. Do I really want to eat these Mexican Stuffed Peppers? Yes, yes I do. And they fit perfectly with this plan. 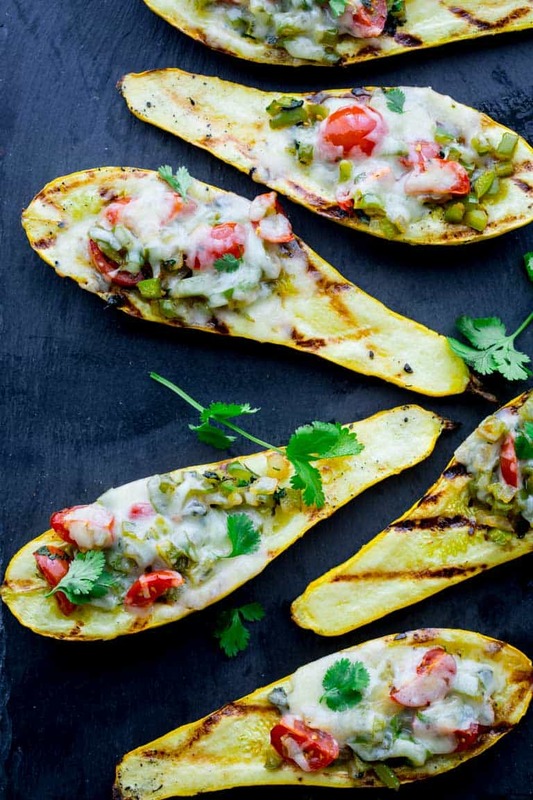 They are awesome since they are low-carb, veggie forward and totally yum. And there is melted cheese so the world can continue to spin. I certainly don’t feel deprived in any way shape or form. And they have a decidedly Mexican flair that puts me in the mood for flip flops! Super yummy Homemade Taco Sauce by Veggie Balance. Are you a Zappos fan? What is it about big boxes? Why do kids always want to play with them? I remember doing that too. Do you think I am on a slippery slope trying to reign it in, or does my plan sound reasonable? Thank you for reading. If you’re new here you may want to sign up for my email list or follow me on instagram to keep up with the latest posts. 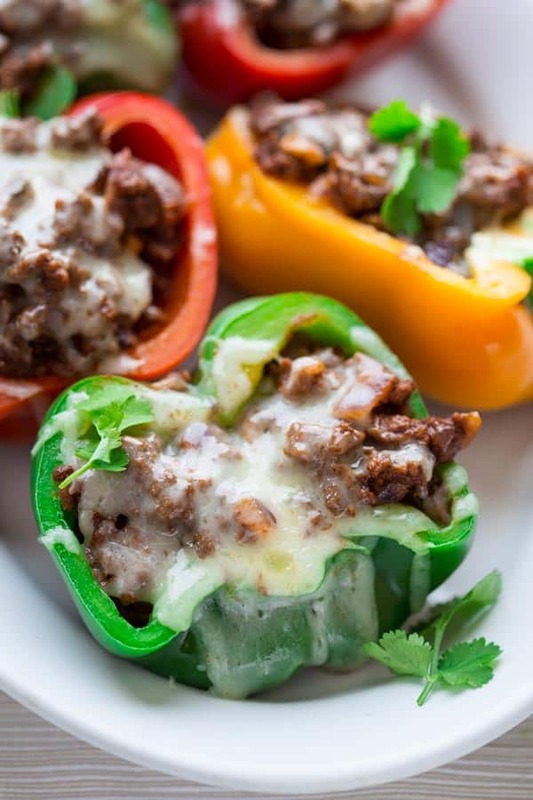 Place the peppers, cut side down in a microwave safe baking dish. Add 1 cup water to the baking dish. Cover with a layer of parchment or wax paper. Cover with plastic wrap. Microwave on high until the peppers are just starting to soften, 4 to 5 minutes. Carefully remove cover, drain off water and turn the peppers cut-side up in the baking dish. Meanwhile, heat oil in a large skillet over medium-high heat. Add beef and cook, crumbling with a wooden spoon until the meat is browned, about 5 minutes. Add onion and mushrooms and cook, stirring often, until the mixture is browning along the edge of the pan and the vegetables are softened, 4 to 6 minutes. Stir in cumin, chili powder, chipotle, salt and cinnamon and cook until fragrant, about 30 seconds. Remove from heat and stir in tomato puree. Fill the peppers with the meat mixture (about ½ cup per pepper half). Top with cheese, dividing evenly. Microwave the peppers in the baking dish, uncovered until the cheese is melted and the peppers are tender, 2 to 3 minutes. 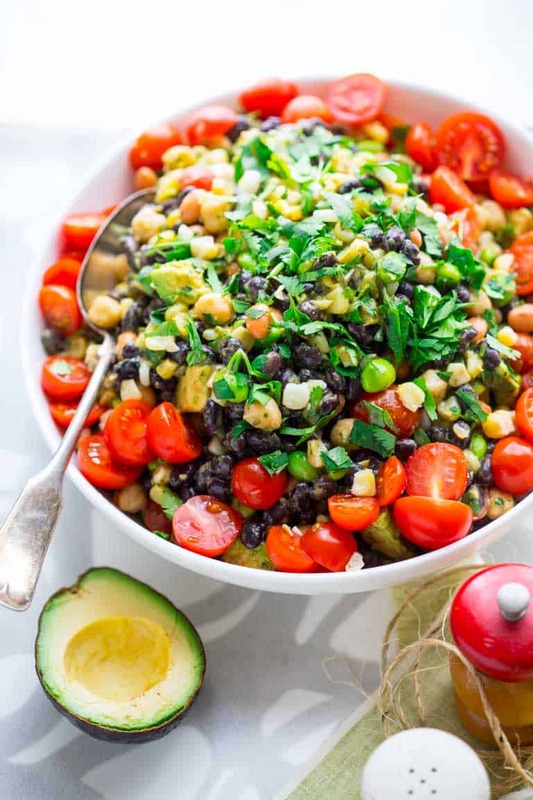 Serve warm with cilantro on top if desired. 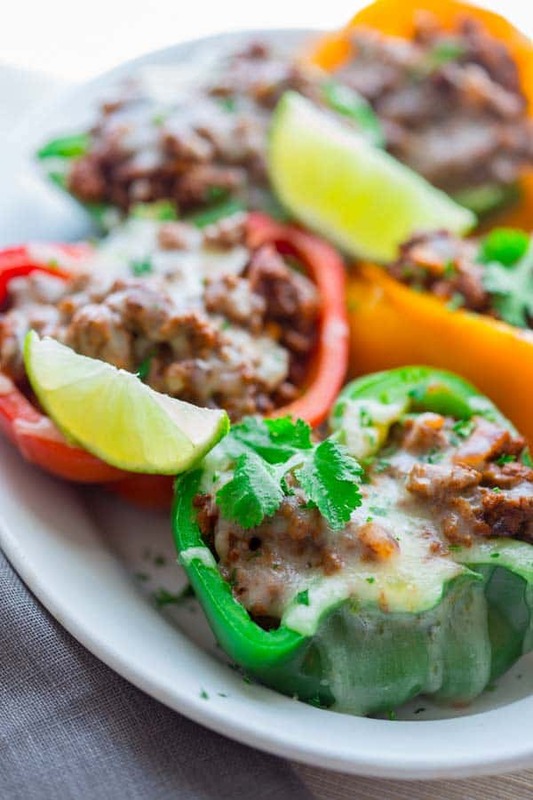 We ate lots of sweet peppers last months..these stuffed peppers look mouthwatering, Katie. That’s so great to hear Angie. Have a great day. Thank you Melanie. I love prime as well. And now we’re into prime video too. Have a great day. Thank you Janice! So nice of you to stop by today! Hope y’all have a wonderfully amazingly fun and safe trip! 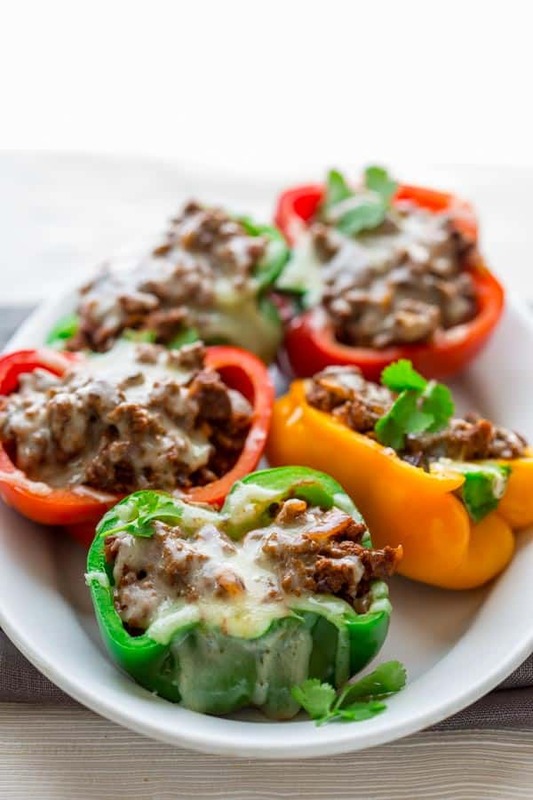 I love stuffed peppers, these look delicious! That’s great Maye. Thank you for visiting. Have a great weekend. These all look great!! And those are some great recommendations, too. Have a great vacation! That melty cheese is just drool-worthy….I love a colorful dinner! 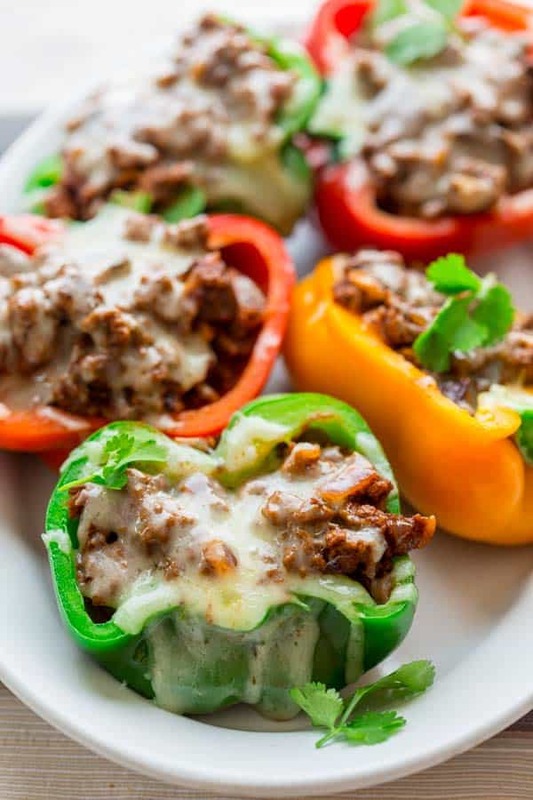 These stuffed peppers look amazing! it’s not an easy thing to make these things look delicious . . and you did! Have fun in Mexico and I love Zappos for shoes, for me and my kids! Oooh…have a blast in Mexico! Such a great time to go…when we’re so longing for summer and breezy white coverups! 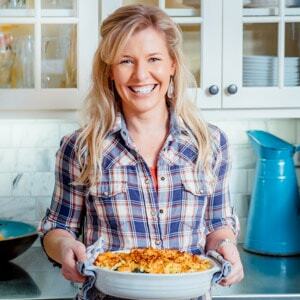 You had me chuckling…love your kitchen story with the kids! We had such a blast ! If you need further suggestions, give me a hollar ! Did you see the photos from the RADISH FESTIVAL ? Or pics of your big sis dancing on her tiny rug ? 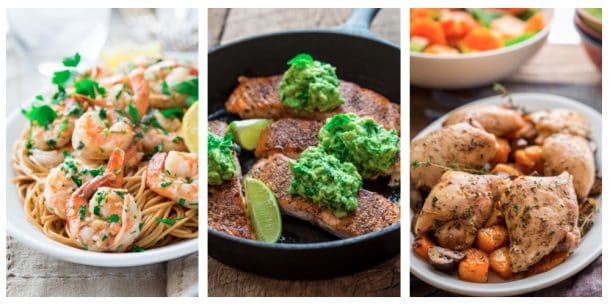 Made this for dinner tonight and it was delicious. 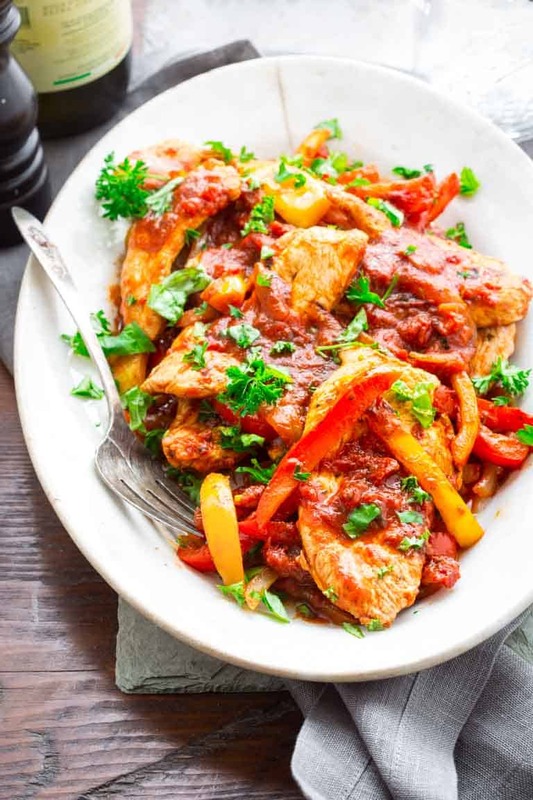 I used a chopped chipotle pepper from the freezer instead of powder. 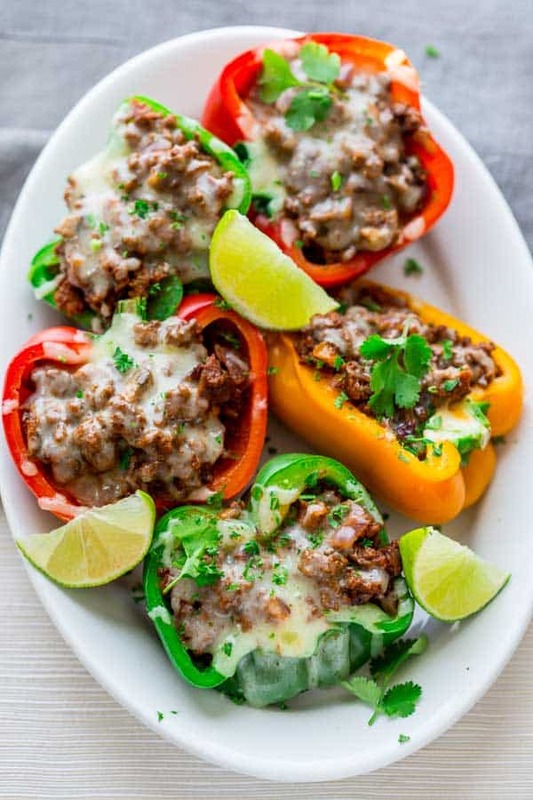 One-half cup of meat filling was exactly right for 6 pepper halves, which leads me to the conclusion that the recipe ingredients should be edited to say “3 large bell peppers” instead OD “6”. Oh my goodness! You are exactly right. Thank you so much for catching my mistake and for coming back to report. I really appreciate it. To clarify, I made it with 3 peppers and cut them in half. I will edit the above to reflect that. If you have extra peppers on hand now I recommend the Mexican sautéed peppers. A similar flavor profile, but just a nice side dish for chicken or beef. I don’t see the nutritional values (# carbs, protein, fat, calories etc..) listed anywhere? These are delicious but I need that information as my husband and I are on different diets and both require that type of info. Did I miss it somewhere? I just analyzed them and popped the info into the recipe for you. It should be there now for you to take a look. In the future, if you’re ever looking for the nutritional info on a recipe, the My Fitness Pal ap is super fast and easy to use. You just insert the URL for the recipe and it will break everything down for you. And the best part is that its free! Gotta love that. Anyway, I hope this recipe works out for both of you and you enjoy it. Please stop back and let us know how it tastes! Thanks Chyrl. Have a great day. I love Zappos too – so easy! only wish they ran some sales once in a while. 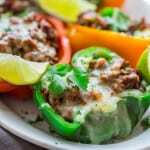 Mexican food is another love of mine and these stuffed peppers look like the perfect way to get in the mood for a trip there! Enjoy! How do you make these without the microwave? I’m a cancer patient who threw out mine. Don’t wish to take any chances but would still like to make these peppers. Thanks! I’d recommend trying this: In step 1 soften them in a large skillet with a half inch of steaming water. Just cover to capture the steam, so they’ll cook evenly. In step 3 You can finish them in the oven at 350, uncovered to melt the cheese. Happy cooking Debra. Thank you for sharing this recipe. It was a huge hit with the fam! I really appreciate your coming back by to report on the recipe Sandra. Thank you! Have a great day. 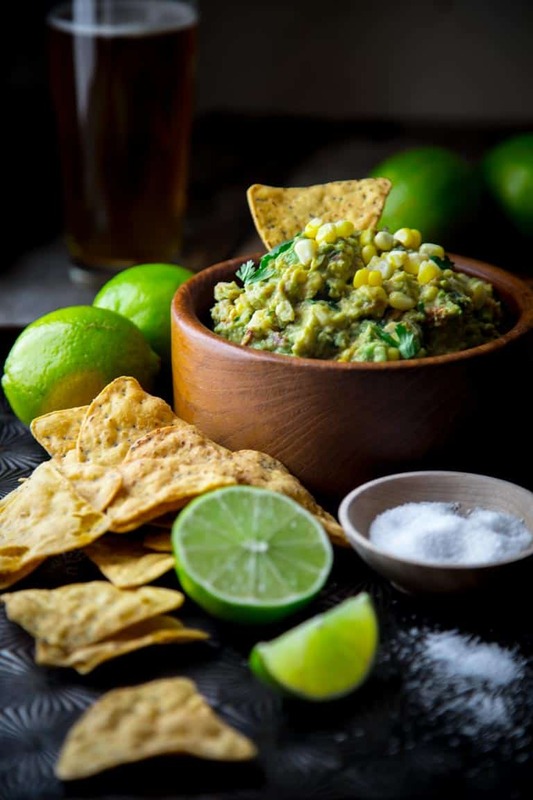 Would a low sodium version kill the flavor in this recipe? They look amazing! Hi Kim, I think that if your palate is used to lower sodium food that would be okay, though I am not sure exactly what you mean. Are you talking about not using the added salt or are you talking about low sodium cheese or tomato puree? This makes me hungry! Looks so good! And I love the aesthetic aspect of all of the colored peppers! That’s always a good sign when the photos make you hungry! Thanks so much Laura. Have a great week. I could eat this for dinner every night! Wow! That’s saying something. Thanks so much Taylor. I love these flavors! And so beautiful with the multicolored peppers! Thanks so much Liz. I am thrilled to hear you like it and thanks for coming by. 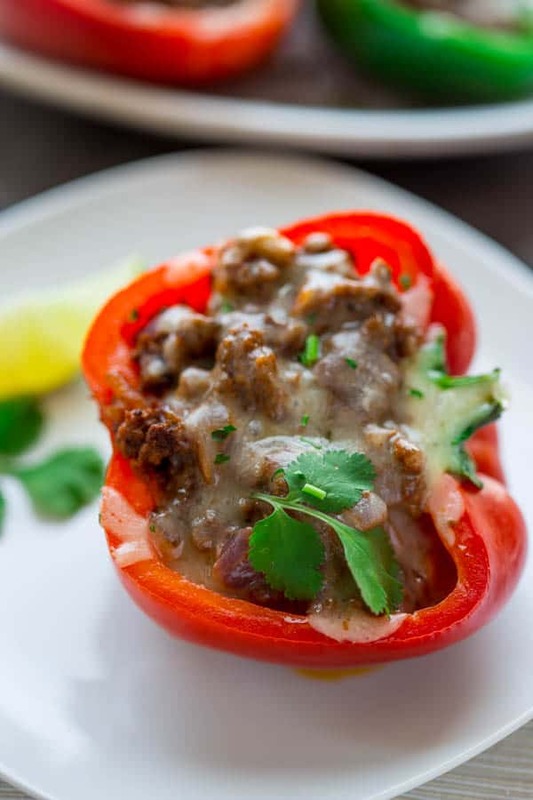 I love stuffed peppers – so many options for stuffings and paired with the crunch of the pepper shell, it’s the perfect compliment. Flavors here are perfection!